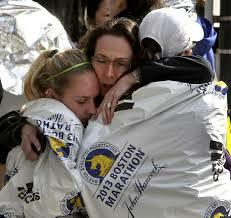 This Woman's Words: Boston Marathon Explosion: A Runner's Dream Differed? I feel so sorry for the victims of todays carnage, the little kids who were killed or severely injured or permanetly maimed, the adults those killed and maimed, the families who are dealing with the loss of their family member. I send my heartfelt sympathies to the families of the ones who passed, for the little children who lost some of their innocence today, for all of Boston who is still reeling from the horror. Please know people do care about you and your beautiful city. Thanks for your comment Rahul. The families and communities directly impacted by the Boston Marathon explosion will be forever changed by the events of yesterday. For those reading this link, we had a close call but our direct family is OK. My mom and dad were at the finish across from the second blast. My dad, an ortho. surgeon from FL, jumped the gates and immediately helped save lives, using even his belt as a tourniquet. My mom assisted those "walking wounded." My husband and kids had luckily not reached the finish yet and the worst they saw were people crying. It took about 45 min to an hour before I found out they were ok. I got to the 25.5 mile marker about 10 minutes after the attacks. Three hours later I was reunited with my whole family. Thank you so much for your love and concern. Please pray for our extended family of Dana Farber Cancer Runners as well as the greater Boston community. Thank you so very much for taking the time to respond to my post. I am ecstatic to know that you and your family are safe. I can only imagine the terror you felt as you waited to be reunited with your family. I would love to give you the opportunity to share your experience in an effort to uplift others. Contact me if you are interested in sharing at womanswords@gmail.com.